It’s like having a personal virtual butler. Smart speakers are trending right now. It’s not hard to see why; they can play music, control home automation devices and best of all, act as your virtual assistant just like J.A.R.V.I.S. from Marvel’s Iron Man. Got your attention? 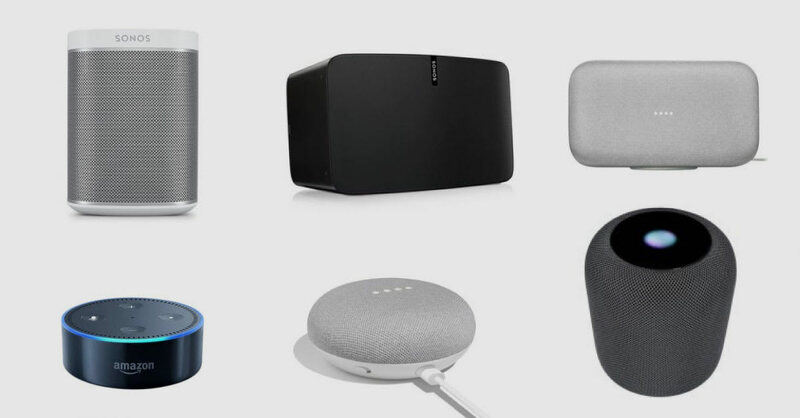 Well, now pay attention to this list of smart speakers – who knows? You might find your perfect J.A.R.V.I.S. The Sonos Play:1 is small and compact; its size is only 16.26 x 11.94 x 3.05 cm, making it the ideal travel companion. It is also the perfect ally for Amazon Alexa; by using this speaker along with any Alexa-enabled devices, you can use your voice to play music, radio stations and many more! It is also humidity-resistant; this makes it a great smart speaker that you can place in your bathroom or the great outdoors without worries. Owning the Google Home Mini is like having a human embodiment of Google by your side. It incorporates the Google Assistant, allowing it to tell you anything from the weather to what song is playing on the radio. It also comes with Bluetooth support – great for connecting it with your other Bluetooth speakers or smartphone. Setting up the Google Home Mini is as easy as ABC. After powering up the speaker, download and run Google Home app on your smartphone or tablet, and take control from there. This smart speaker from Google is the best smart speaker for your home. This smart speaker can produce music that is loud enough to be heard and yet, soothing enough to be enjoyed. The voice recognition is rather responsive – you can play, replay, skip, pause and control the volume just by using your voice. It also features SmartSound, which employs machine learning to adjust the setting of the equaliser automatically to match it to the acoustics of your room – a perfect feature for the die-hard audiophiles. Own an Apple Product? Pair it up with the Apple HomePod, and you'll have a match made in heaven. You can ask it to do anything from sending texts to keeping you up-to-date with the latest world news just by saying, "Hey Siri”. It can also stream any song on Apple Music and play any track on your iTunes library. The Apple Homepod will keep a record of the music you like and will recommend you new songs based on your preference with the help of Apple Music and the highly intelligent virtual assistant, Siri. The ECHO Dot 2nd Gen can connect to your headphones/speaker via Bluetooth or a 3.5mm audio cable – so you can experience the best of both worlds! Its mini and minimalistic design makes it a wonder to behold giving it an unprecedented advantage – you can snug it just about anywhere, and it'll still do its job. You can also stream music from Pandora, TuneIn, Spotify, etc. Best of all, you can access them via voice control – no buttons needed. The Sonos Play:5 is the best wireless smart speaker that you can get in the market today. It can produce audio that best matches what a full-sized Hi-Fi can do, translating to a sonorous sound with all the crisp mids and highs. The bass response is deep and tight as well. The volume and track controls change according to the orientation of the speaker. You can control the speaker through your tablet or smartphone, but the best way to tune it is through the top-panel touch controls. The speaker will emit subtle tones to indicate that it detects and acknowledges your contact. The Ultimate Ear MEGABLAST is one of the few smart speakers that are waterproof; you can immerse it in water for up to 30 minutes. It is perfect for those who want to pump up the jam at a pool party. Another X-factor of this smart speaker is its superior audio quality. It can blast 360° of heartfelt music, allowing you to enjoy your tunes and experience other functions to the fullest. Bass-lovers will appreciate this speaker as it produces thundering sounds with all the vivid mids.